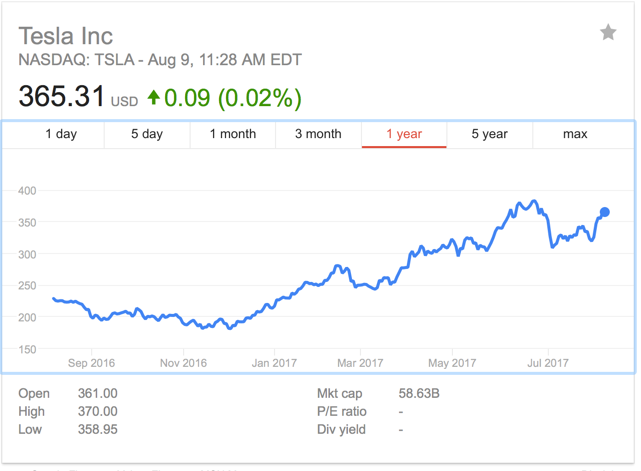 Musings on Markets: A Tesla 2017 Update: A Disruptive Force and a Debt Puzzle! 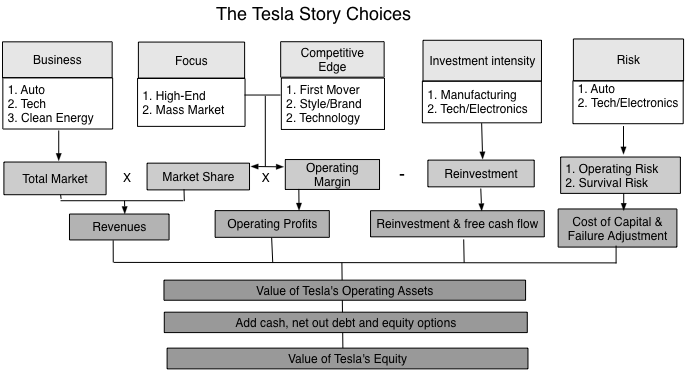 What do you get if you value Tesla as a real option on market leadership in the world of self-driving ride-sharing vehicles powered by energy generated off the rooftop solar panels and stored in mass-produced batteries? A back of the envelope calculation says the company would be worth north of $500B in that world. Is it a plausible story that Mr. Musk has at least a 10% chance of getting there? 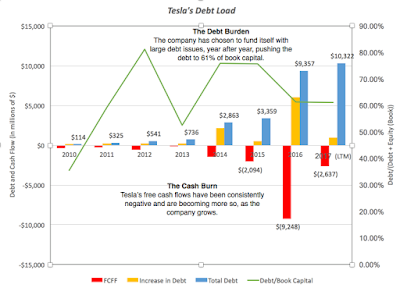 While I totally agree with the challenges that you have laid out for Tesla to surmount and I generally agree with your valuation, I think that the debt puzzle might be overlooking the idea of a "Pecking Order." 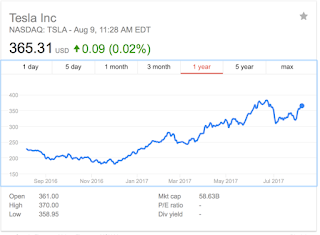 Could it be possible that Elon Musk feels that Tesla common shares are overvalued, but is overcompensating and doesn't want to signal this to the marketplace? 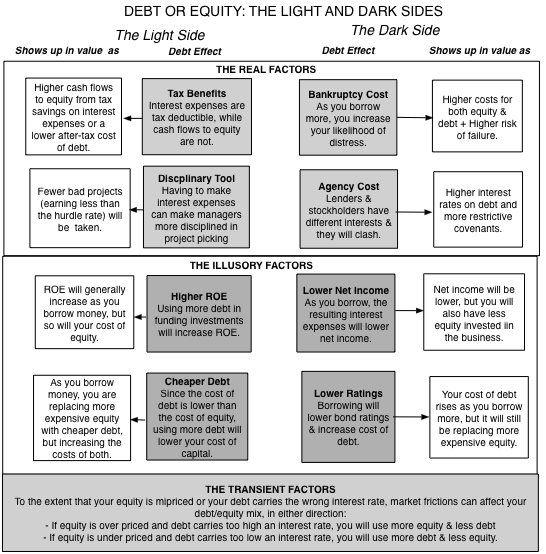 I think that his choice to issue debt could provide "false bravado" in the current price. Might it be that those institutions that already own Tesla stock cannot or will not own any more, making the the market for any secondary offering of equity less liquid resulting in far greater dilution than would otherwise be the case and consequently taking the shine off of the rose? Convertible bond market is not particularly deep to begin with and therefore might be a tough money raise. Not a fan of investment bankers, but there may be some reason for going to HY market. While I am in general agreement with your point that bondholders should not regard themselves as beneficiaries of the upward Tesla trajectory to any greater extent than its abilities to service debt (if that indeed was your point), it would be interesting to know how other motor company bonds are priced in comparison: Tesla debt may be selling on relative merit as a kind of a hedge 'If Tesla does great, GM bonds will fall. I have some GM bonds - better have some Tesla". In other words the downside fear of traditional motor company prospects combined with the obvious *potential* for Tesla, may lever enough perception to dazzle the debt purchasers. But in general I agree, seeing that Musk himself has commented on market overexuberance for Tesla stock, that it is most peculiar that more stock is not issued. I say, with some seriousness, perhaps he is keeping it as future collateral for Marsward exploits. BTW I do enjoy your analyses, particularly that they accommodate within one framework, different narratives or lines or reasoning. 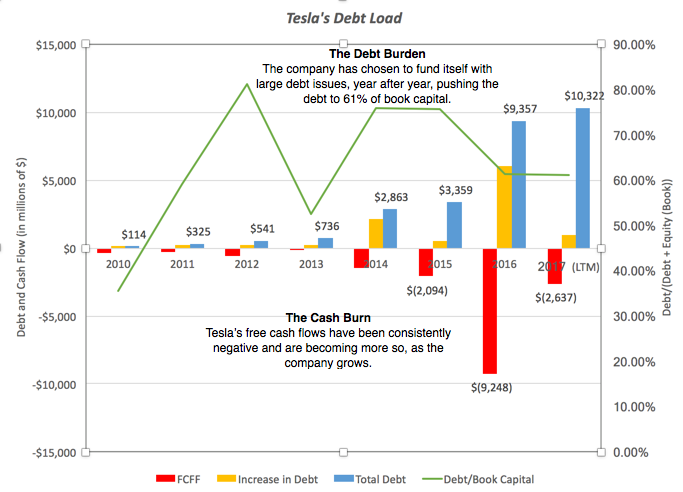 Very interesting and thank you Professor but given that the arguments against debt financing in this situation are pretty obvious it would be interesting to know Tesla's reasoning because the company has certainly considered the issue. Those who can, do; those who can't, teach. 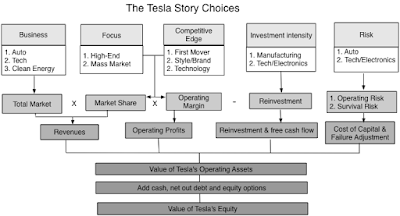 And those who can't teach, short Tesla stock then write negative stories about Tesla. 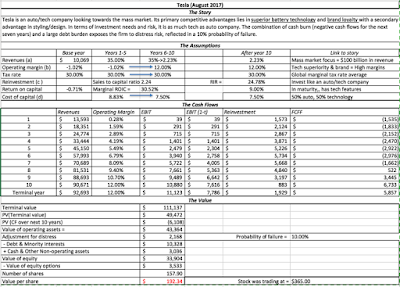 As you may be aware, Seeking Alpha often runs negative analyses about Tesla. One article opined that Elon Musk may have chosen to issue debt because an equity offering would have required disclosures which he was not ready to disclose. 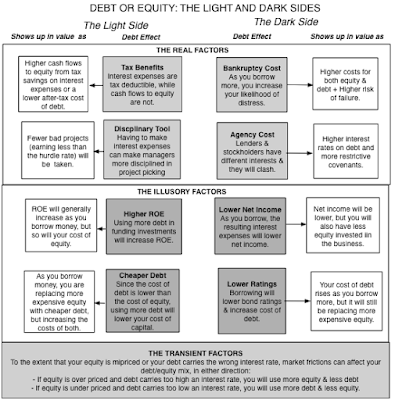 I do not know if equity issuance requires a higher level of disclosure than a debt offering, but it is worth considering. Of all the risk factors you mention, I think "manufacturing hell" is the greatest. I have read a number of comments from businessmen who claim to be experienced in large scale manufacturing who say ramping up to the Model 3 levels will immensely difficult, that high-speed manufacturing requires years of experience to master. 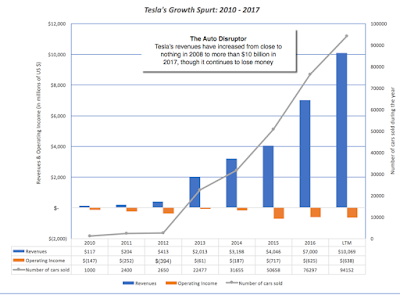 Given Tesla's inability to make money manufacturing expensive, low-volume cars, I think skepticism about Tesla's ability to make money on lower-priced, high-volume cars is warranted. I know Elon Musk is brilliant and his accomplishments are astonishing, but making cars is still a gritty, difficult process. I have read about the huge order backlog for the model 3 -- I have a friend who put down $2,000 for two Model 3's but has no intention of buying one. I think he is hoping to "flip" his place in line. I wonder how many deposit swill fade away? 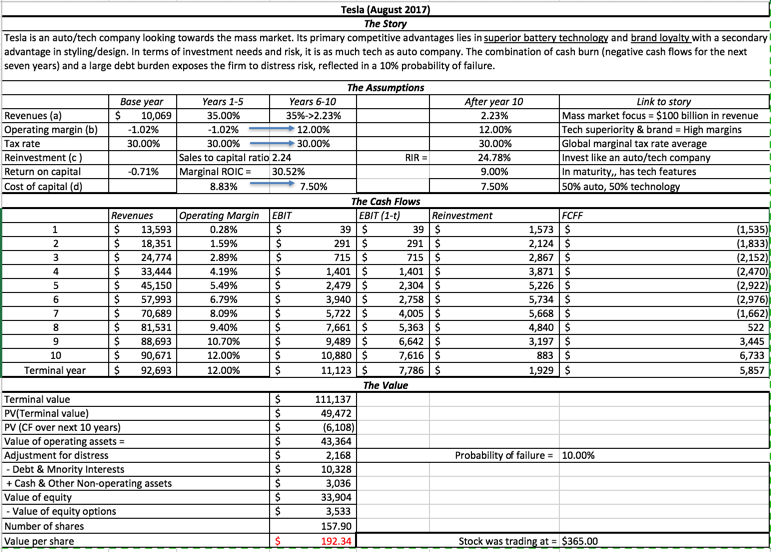 Absolutely agree that Tesla is overvalued. Now everything is focused on production and sale of more cars. But with increasing cars on the market will be sufficient after sale services? Will be current customers satisfy with quality of cars and after sale services? Are Tesla cars really as good as everybody think? Tesla has no history. Repair of the car cannot be made from computer. Do you think that other car makers will not produced comparable cars? Can Mercedes, BMW and other car makers produce comparable or better cars in a few years? The manufacture of cars becoming financial institution, because a lot of cars are sold for loan or leasing, thats why there will be additional need of financing. The cars companies become software companies. Is Tesla prepared for that? Is Tesla one man show? Are the electric cars really the car which will win the market? Will not other renewable type of cars win the market? Producers of cars report the best numbers of sold cars in the history. Can it continue to the sky? What happen, when slowdown or recession appear? Automotive industry is very competitive industry. On the market are better opportunities than Tesla now. Interesting analysis Professor..Few thoughts in mind..
Is it worth comparing how it happened in Industrial revolution in last century or is it the case that , it was OK move at slower rate then than today's connected and competitive world ? Finally charisma of Elon Musk is big part for Tesla...which is hard to value and predict...But companies like Tesla are important part of evolution and hope it does good !! I'm not sure I agree with the 12% target operating margin. The assumption for this high margin is a combination of premium due to the brand, improvements in manufacturing technology for their cars. TSLA's ability to command a higher price due to its brand is going to decrease as they continue to push to targeting the mass market. The premium they command will decrease as a result. Cars unlike iPhones are a big expense and consumers are unlikely to pay for increased prices for basic cars. This is especially the case as many other manufacturers begin producing new electric vehicles. The improvements in manufacturing to the extent that they have a lower manufacturing cost than large car companies like Toyota is unlikely given their lack of patents. They're also up against major auto manufactures that have decades of experience in mass-producing cars. Currently high turnover in employees is also a bad sign for this sector. Professor, this aged very well. 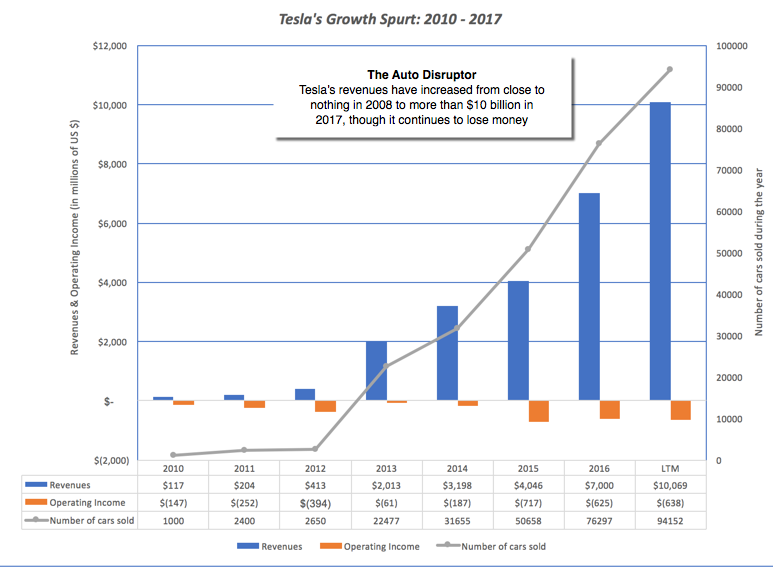 Still unknown if Tesla will get through this ramp up of Model 3 or not, but certainly the biggest risk appears to be materializing. I would say now the biggest unknown is the margin, do you have any comments on that with the current situation April'18?